Speaking at a rally on Monday, Sena president Uddhav Thackeray called the NCP and Congress scamsters and thieves. His reference to the drought was actually to the previous one, when the NCP, according to Uddhav, indulged in corruption in the fodder camps for cattle. IN PARBHANI’S Selu taluka, where groundwater levels have dipped by about 3.59 m from the last five years’ average, the current drought has turned the focus on the inequities in water availability. “Travel down this road 10 km and you will see acres of lush crop. Because they’re served by a canal further south,” said Sandeep Khandagle of Moregaon in Selu. 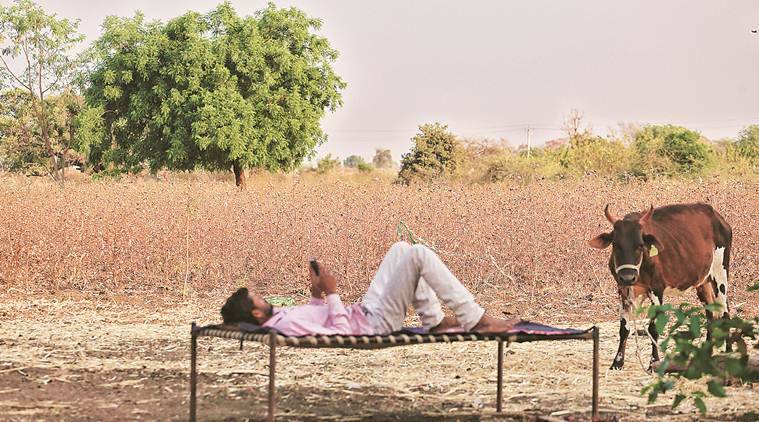 But in election season in drought-hit Parbhani, the Shiv Sena, which holds the Lok Sabha constituency, is simply pinning its hopes on its decades of cadre-building in the district and the region’s fraught relations between Hindus and Muslims. Campaigning for sitting MP Sanjay Jadhav, seeking re-election for a third term, MLA from Jogeshwari East in Mumbai and Minister Ravindra Waikar also invoked the three decades of Sena rule. “This is a Sena fortress and will remain so,” he said. Across the district, the sense of anger against the government for slow relief work despite an early drought is widespread. Horticulturists in Ghansawangi (in Jalna district but within the Parbhani Lok Sabha constituency) have suffered a nearly 20 per cent hit in sweet lime production, the water crisis in Jintur and Gangakhed is acute with these towns receiving water supply once every 10 to 12 days, and hundreds of Parbhani’s farmers have complained about not receiving crop insurance payouts. Meanwhile, the Sena incumbent was also in the news after a district-level monitoring committee, headed by the district election officer, found a news item published in local publications as being “paid news”. In addition, the region’s Marathas are being exhorted by some community organisations to vote against the Sena-BJP on account of the non-implementation of the Maratha reservation law. However, despite the anti-incumbency, Prime Minister Narendra Modi remains popular. The NCP candidate, former Zilla Parishad president Rajesh Vitekar, said he wants to keep the focus on development and agrarian issues. “In 30 years, the Sena has not brought any industries or any major schemes to Parbhani… My vision for Parbhani is to replicate Sharad Pawar’s vision for Baramati, and the work he did in the state,” he added. Only five per cent of Parbhani’s voters, in his estimation, will be swayed by the Sena-BJP’s strident campaign on nationalism, terrorism and the air strikes across the border. The Sena-NCP contest in the district is a keen one. In 2014, Sena defeated NCP’s Vijay Bhambale by over 1.27 lakh votes. But at the October 2014 Vidhan Sabha polls, the Assembly segments of Jintur, Ghansawangi and Gangakhed were won by NCP MLAs, Parbhani is represented by the Sena while Partur by the BJP. The sixth Assembly segment, Pathri, is currently represented by Independent MLA Mohan Phad, a former Sena leader now with the BJP. Privately, senior NCP leaders, as well as a handful of senior former Shiv Sena leaders who are supporting Vitekar, said that the presence of CPI candidate Rajan Kshirsagar, Vanchit Bahujan Aghadi’s Alamgir Mohammad Khan and BSP’s Vaijnath Phad will cause the anti-Sena vote to be fractured. Speaking to The Indian Express, Kshirsagar said that the Sena will lose Parbhani, “and it will be because of me”. But as the Sena campaign rolls on, while Uddhav, as well as Yuva Sena leader Aaditya, have arrived to campaign for MP Sanjay Jadhav, there’s growing chatter on social media and on WhatsApp about Rajesh Vitekar. In a face-off between the Sena’s disciplined cadre in Parbhani and the NCP’s rural presence, the 39-year-old candidate’s appeal among first-time voters, angry Marathas and desperate farmers will frame a close contest.